Vultures still poisoned in the Mara! One early evening in February, an alarm was raised of a poisoned vulture at the Paradise Plains in the Mara National Reserve. Stratton Hatfield, a researcher with the Mara Martial Eagle Project, noted that the White-backed Vulture displayed symptoms of poisoning and made a call for action to help save the bird. With the help of the Kenya Wildlife Service veterinary officer, the bird was moved and placed on a treatment program. The manner in which this news spread was startling: a social platform has been formed called “Mara Poisoning Response”. This platform helps engage people, including rangers, vets, researchers, wardens and managers, to get updates of any other casualties and share information of any other poisoning events in the Mara. Poisoning accounts for over 60% of recorded vulture deaths in Africa. In most cases, this happens when predators kill livestock and herders poison the carcass to kill the predators. Poachers also poison vultures. 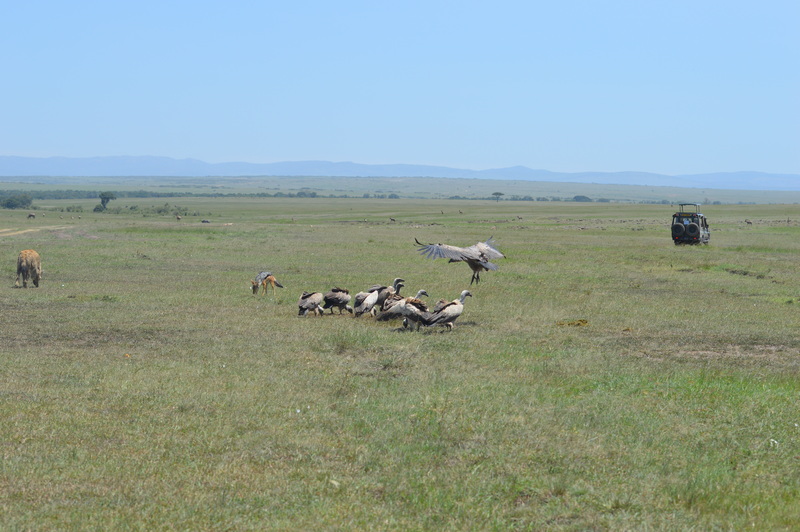 Over the past two years, Nature Kenya, BirdLife International, The Peregrine Fund and other conservation stakeholders have been championing and raising awareness on the plight of vultures. It is clearly evident that these efforts are yielding positive results, based on the kind of attention and response the current poisoning event attracted. Rangers from the conservancies and the Mara Reserve have been mobilized to enhance patrols, especially around thickets and riverbeds since sick vultures seek darkness and shade and also tend to feel thirsty. From the thorough patrols being conducted, a number of other White-backed Vulture casualties have since been reported: 3 at Naboisho, 3 at Ol kinyei, 1 at Double crossing and we ended up losing the one that had been rescued at Paradise Plains. At the same time, six lions and 74 vultures were found dead near a national park in southern Tanzania after they were allegedly poisoned. Timely response to poisoning incidents can significantly reduce resultant wildlife deaths and environmental contamination. In future, we need to have the necessary equipment and machinery in place to facilitate timely response and minimize casualties. Lake Ol’ Bolossat now protected!